Care is provided by dedicated, friendly staff under the professional supervision of the manager. 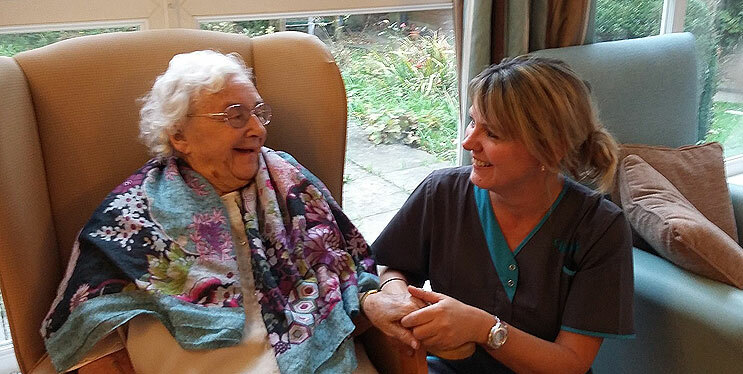 All staff are regularly trained and provide cheerful and sympathetic care at all times of the night or day. Manager: Allison has spent the last 14 years as a Chief Executive for a large Charity based in SE London within the field of Brain Injury providing support services for people in acute care in partnership with Kings College Hospital London. Allison has also developed and managed post injury psychosocial rehabilitation, in 3 day services across London and extended support to people within their own homes and the local community. A large proportion of Allison’s work and interests are around the issue of memory management and meaningful activity for individuals through goal planning. Through her work Allison has developed multi-disciplinary care pathways and developed services for individuals and families and in doing so has developed a great deal of experience in the charity sector. Allison also has had a number of years’ experience, as a Community Manager working with adults with disabilities in their own homes, and also experience of managing residential services for older people the latter of whom were experiencing and presenting with severe and enduring mental ill health..
Deputy Manager: Wendy has had 26 years experience in the caring industry, the last 14 of which have been with Tynwald. Secretary to the Trustees: Gillian has worked closely with the trustees for the last 19 years to ensure that all the home's obligations are met. She deals with the finances and is happy to discuss any queries regarding payment for care. Team Leaders: We have 6 team leaders, all who are qualified to NVQ 3 standard or above. Chrissy, Leah, Carol and Josie have between them many years experience of working at Tynwald and Sue and Judy have recently joined us. Care Assistants: The home has 10 carers, who have all been trained to a high standard. Most have or are working towards an NVQ qualification. Ancillary Workers: We have an additional 7 workers including cooks and domestic staff who ensure the home is kept clean and that food is of a good quality. Activities Organiser: Every week Fiona plans activities and entertainment to enable the residents to live a full and stimulating life. Christopher Ducat-Chairman, John Schoner-Vice Chairman, Peter Golding-Treasurer, Shirley Moberly and John Wren. Allison Joined Tynwald on the 14th January 2014 she is now helping to develop the service offered to the people living at Tynwald, engaging people in person centered support through a dynamic, and informed staff team. Allison will also be looking at how to further promote and develop services for older people through Tynwald in Hythe and the surrounding areas.